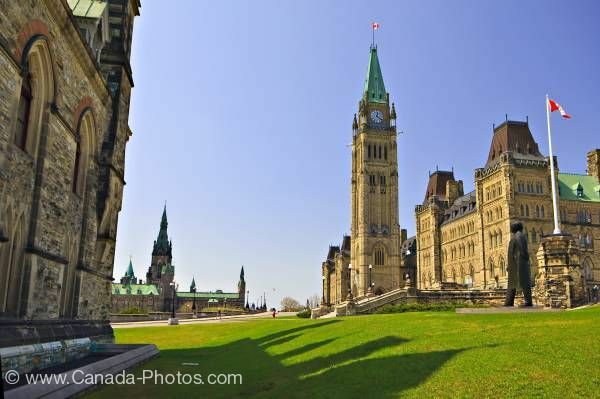 From the manicured lawns is a view of the Centre Block and Peace Tower of the Parliament Buildings flanked by the East and West Blocks on Parliament Hill, City of Ottawa, Ontario, Canada. The classic Gothic style architecture of the Parliament Buildings along with the Peace Tower and the Canadian flag. Beautiful stone and patina roofs add to the charm of the architecture. Centre Block and Peace Tower of the Parliament Buildings flanked by the East and West Blocks on Parliament Hill, City of Ottawa, Ontario, Canada. Please let me show you more of my pictures from my "photo gallery: Ottawa City Photos". Pictures from photo gallery "Ottawa City Photos"